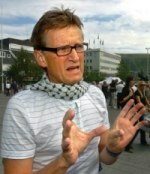 Mads Gilbert, a Norwegian doctor in Gaza, is all over the mainstream media, claiming that Israel is indiscriminately and purposely murdering civilians. He’s given interviews to the BBC, CBS, NBC, CNN, ABC, the Independent, Sky News, and the New York Times, among others. And in 2001, shortly after the 9/11 terror attacks, this supposedly impartial Norwegian doctor (actually a radical Marxist member of Norway’s Red party) expressed support for the hijackers. Of course, not a single mainstream media report on the creep mentions any of this.